This is a Space Grey HomePod with a UK-style plug. Apple HomePod (MQHW2B/A) Wireless Speaker. Condition is Used. Dispatched with Royal Mail 1st Class. Apple MQHV2BA HomePod Portable Bluetooth Speaker - White. Had thus a couple of months but just not using. Box opened but original packaging still on (see photos) so you really are getting something that’s literally just been taken out if the box, turned on and then put back in the box. Thought I’d get around to using it but never reopened so eBay it is. This thing is heavy so postage reflects this (and insured value). hardly used Apple homepod in white. excellent device in excellent condition like new. selling as hardly use this speaker. smoke free home £220ono buyer to collect! bargain. It’s the ultimate music authority, bringing together Apple Music and Siri to learn your taste in music. And that’s just the beginning. It automatically analyses the acoustics, adjusts the sound based on the speaker’s location, and separates the music into direct and ambient sound. Apple MQHV2BA HomePod Portable Bluetooth Speaker - White. Condition is Used. Comes with original packaging box. Dispatched with eBay delivery – Shutl 1 day. Official Apple HomePod Space Grey Less than a year old, hardly has any use at all been in box for months & this is the reason for the sale. Comes with all original wires & original box. 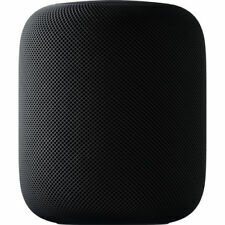 Apple HomePod (MQHW2B/A) Wireless Speaker. Condition is Used Once - Opened and boxed again so practically brand new. Dispatched with Royal Mail 1st Class. Apple HomePod - Hardly Used - Only purchased 5 months ago! I inherited this item and I just simply don't seem to use it and prefer using my CDs off my stereo! 5 out of 5 stars - Apple HomePod - Hardly Used - Only purchased 5 months ago! 15 product ratings15 product ratings - Apple HomePod - Hardly Used - Only purchased 5 months ago! Condition is New. Dispatched within 24 hours. High-excursion woofer with custom amplifier. Bluetooth 5.0. Multi-room speaker support with AirPlay 2. I also have Space Grey Colour for sale. Stereo pair capable. Apple Homepod Siri Smart Wi-Fi Speaker-White. Dispatched with Hermes Tracked. New, opened box to check contents and all is in working order. New listingApple Homepod - Boxed In Mint Condition - Hardly Used! Apple Homepod - Boxed In Mint Condition - Hardly used. Grab a bargain, will be packaged well and sent quickly. Sounds great!! The array of six microphones can pick up your "Hey Siri" from across the room, even when loud music is playing. It also learns preferences and tastes that are shared across devices. to change the mood. NEW! Apple Homepod Smart Speaker Wireless SpeakerS White Wireless Lan Bluetooth. Condition is New. Dispatched with Royal Mail Special Delivery (TM) 1:00 pm. With John Lewis Receipt for 2 Year Warranty . New listingApple Homepod Siri Speaker White MQHW2B/A Model A1639. Brand New & Unused. Apple Homepod Siri Speaker White MQHW2B/A Model A1639. Brand New & Unused.. Condition is Used. Dispatched with Royal Mail 2nd Class. With Apple Music, access over 45 million songs, and combined with Siri, it can learn your taste in music. As you move about the house, your music can follow. Keep up to date with news, traffic and weather. Apple HomePod Smart Speaker - Unopened. £280 RRP. Free postage. Apple MQHV2BA HomePod Portable Bluetooth Speaker - White. Condition is New. Dispatched with Royal Mail Signed For® 2nd Class. It' the ultimate muic authority, bringing together Apple Muic and iri to learn your tate in muic. And that' jut the beginning. A breakthrough peaker all round. Wirele LAN: Ye. Bluetooth: Ye. Compatibility: Apple TV. With more of a focus on the quality of the music you listen to, Apple have produced a powerful speaker that sounds amazing and adapts to wherever it's playing. It's the ultimate music authority, bringing together Apple Music and Siri to learn your taste in music. Pristine condition with original accessories and in original box. With Apple Music, access over 45 million songs, and combined with Siri, it can learn your taste in music. Awe-inspiring choice of music with Apple Music. HomePod is a powerful speaker that sounds amazing and adapts to wherever it's playing. It's the ultimate music authority, bringing together Apple Music and Siri to learn your taste in music. It's also an intelligent home assistant, capable of handling everyday tasks - and controlling your smart home. HomePod takes the listening experience to a whole new level. And that's just the beginning. We completely reimagined how music should sound in the home. HomePod combines Apple-engineered audio technology and advanced software to deliver the highest-fidelity sound throughout the room, anywhere it's placed. This elegantly designed, compact speaker totally rocks the house. *** TAP FOR FULL DESCRIPTION & SPECIFICATIONS ***. Smart Assist from Apple. Awe-inspiring choice of music with Apple Music. Smart Assist. Stupendous sound with powerful bass from a beautifully compact speaker. If you need english manual, you can download at their website easily. For screens of smartphone, fewer than 3 dead or light pixels or white /black sport are considered to be normal. If you need english manual, you always can download at their website easily. Virtual Assistant Support Apple Siri. Processor Apple A8. Supported Audio Formats AAC, AIFF, Apple Lossless, FLAC, HE-AAC, MP3, Protected AAC (M4P), WAV (LPCM). Weight 5.5 lb / 2.5 kg. AC Input Power 100 to 240 VAC, 50 / 60 Hz. Awe-inspiring choice of music with Apple Music. Simple, instant set up.